Twenty years ago, I lost a good friend. Well, not exactly a friend, but a place. Stone Mountain Airport closed twenty years ago in June. Stone Mountain Airport was one of the older airports in Georgia. It had been in continuous operation since 1930 until it closed in 1996. It was a very special place, with lots of character. It originally had crossing grass runways in the early days. By the time I started frequenting the place in 1989, there was but one runway -- a 2800 foot stretch of asphalt oriented 170/350 degrees. The FAA solved this problem by requiring pilots to fly a three degree profile and clear the building by a sufficient height, which dictated a 1200 foot displacement. This mean that takeoffs on Runway 35 or landings on Runway 17 effectively lost nearly half of the usable runway length. 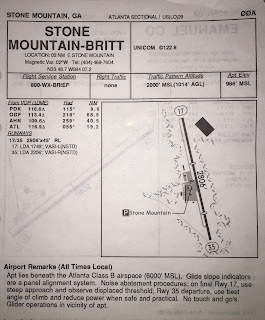 Stone Mountain airport was an uncontrolled field -- meaning it did not have a control tower. For my flying buddies that learned to fly at Peachtree-DeKalb airport, Stone Mountain seemed like something out of the wild west. A scary place where only the most daring of pilots went -- a too short runway with no controllers to talk to. Frankly, those of us comfortable at Stone Mountain felt the same way about Peachtree-DeKalb -- that it was a scary place. It had jet traffic, and you had to talk to someone to get permission to taxi, take-off or land. The FBO was in a small white building with three rooms. As you approached the door, you'd notice two white benches on either side, under an awning. These benches were a mere 100 feet from the center of the runway, so it was a great place to watch planes take off and land. Inside, there was a great big room a dilapidated sofa and several easy chairs. At one end of the room was a huge stone fireplace. In the winter, there was always a wood fire going, as it was practically the only source of heat. Just behind the sofa was the counter, where you could pay for your fuel, buy maps or AF/Ds, or pick up an ice cream sandwich before going back outside to the white benches to critique the landings. Behind the counter was a small room that served as a classroom and office. Landing at Stone Mountain wasn't all that terribly difficult, so long as you had reasonable control over your airspeed. The short runway left little room for excess speed, and pilots there had no qualms about going around. Prevailing winds generally favored using runway 35, which was the longer of the two runways. Crosswinds made this more interesting. The presence of a 900 foot dome of solid rock a couple of miles away from the runway made crosswinds more common. Winds out of the west would wrap around the mountain and produce a burble on the approach to runway 35. Best technique was to crab on final and keep adjusting, as the crosswind usually disappeared as soon as you dropped below the tree line. Usually. If not, you'd kick into a slide slip just before touchdown. While it sounds nerve-wracking, it wasn't so bad once you knew what to expect. When the winds favored runway 17, airspeed control was even more critical, as a delayed go-around faced the prospect of putting the airplane into the tall trees off the end of the runway. Approaches were gauged with the Mark I eyeball and the "poor mans VASI." We had no proper VASI, but about the time the displaced thresholds were ordered by the FAA, a clever arrangement was set up. About 50 feet from the runway, three large boards were placed horizontally. Two were held spaced apart and painted white, while the third was further down the runway and painted orange. If you were on the three degree glideslope, the orange board would appear directly between the two white boards. Crude, perhaps, but it worked well. You could easily tell if you were too high (and thus carrying too much kinetic energy) or too low (and risked going into the trees). The front, white boards were right at the displaced threshold, too, which made it easy know where to land. Landing at night generally favored runway 17 in any case. You'd fly over the bright parking lot of the Walmart across highway 78, and squint into the darkness for the LIRL (low-intensity runway lights) around the runway. Seriously. You'd never want to set up a landing for runway 35. You'd never see the trees on the approach end, and the lights of Walmart would prevent you from making out the runway as you got close. Stone Mountain did have it's share of accidents -- some minor, some fatal. On one particularly windy day, I witnessed a fellow in an Ercoupe make three landings before mid-field on runway 35. The second bounce broke the nose gear, and a bunch of us had to push it off the runway. Clearly a case of pilot-induced oscillation trying to force the aircraft down. My friend Forrest broke a beautiful Cessna 172 -- N7654G. He was out flying on a particularly blustery day, attempting to land on runway 17. He had already gone around once, and made the approach with a bit more determination. Unfortunately, he dropped it in so hard, that one wing hit the ground, then the plane rocked back the other way so hard the other wing hit. Nose gear collapsed also, but both wings clearly had a bit of extra dihedral. Forrest walked away, unhurt, other than his pride. Summertime could be difficult, as the heat and humidity would cause the density altitude to rise. A pilot renting a 172 packed the plane very full with four adults on a summer afternoon, ended up putting the plane on the road beside the warehouse north of runway 35. His takeoff was very anemic, which he should have aborted. He was still in ground effect as he left the runway environment. While no one was hurt, it was too close. While Stone Mountain had a few hangars, we mostly parked our planes out on the grass at tie-downs. Some were in the back forty where the old grass runway used to be. Mine was across the runway from the FBO, about 150 feet from the runway. Some folks might think this strange -- having pedestrians cross an active runway on foot. No, perfectly normal. Yes, I'll never forget that feeling crossing the runway on foot on a crisp autumn morning, getting ready to preflight my Cessna 150D for a Saturday of flying. It would be chilly, the grass would be wet with dew, and the earth gave off a rich, wet smell. For several years, Stone Mountain was host to a glider operation. A Cessna 305A / L-19 "Birddog" was the tow vehicle, and the pilot would waste no time after release getting back down to the ground. 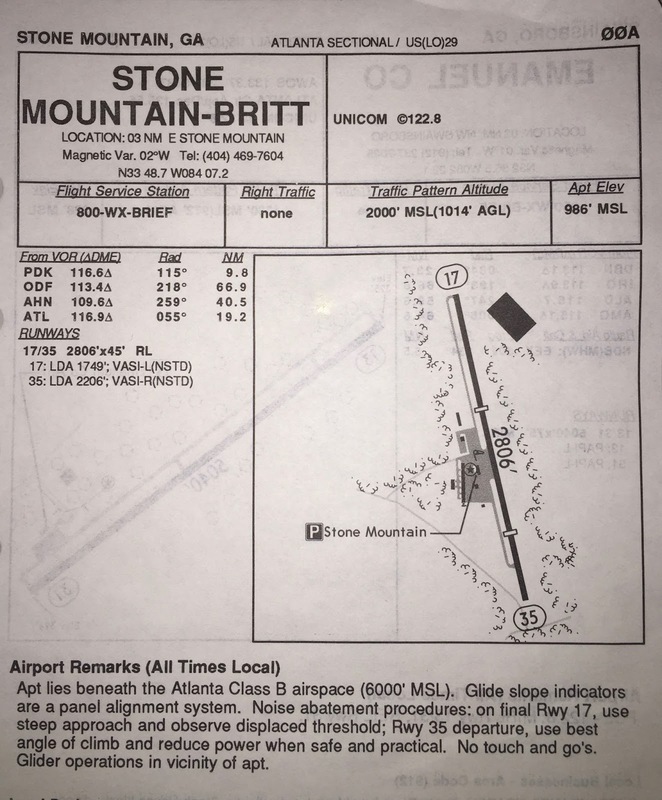 For the L-19, Stone Mountain seemed a copiously large airport. Glider rides were very popular over the mountain, and, in retrospect, were relatively cheap. $85 bought a ride from 5,000 feet, and I took one on my 30th birthday. It seemed over all too soon. Stone Mountain pilots were a pretty social crowd. On July 4th, Stone Mountain Park would put on a pretty good fireworks show, and we could go up to the airport and watch. Now, we were on the wrong side of the mountain -- most of the action was in front of the carving. But we could see plenty. In the warmer months, pilots would frequently gather for an impromptu "dawg killin'". This was a euphemism for a cookout with hotdogs and hamburgers, and plenty of aviation conversation. I remember a couple of pilots that I haven't seen since the airport closed. There was "Jack" (not his name) who was a perpetual student pilot. You see, he'd never gotten his private pilot's license. He probably had a couple of thousand hours by the time I met him, likely most of them undocumented. He had a Cessna 172 and flew frequently -- but I never knew him to take any passengers. There was another fellow who owned a DeHaviland Chipmunk. It was a joy to see that plane in the air, with it's inverted, in-line four-cylinder engine. It cut a handsome profile with it's unusually narrow and long nose. But we rarely saw it in the air. I generally remember this fellow sitting on one of the white benches on a beautiful Saturday, debating on whether or not to pull his airplane out of a hangar. I do remember on fatal accident while at Stone Mountain. I arrived early one spring Saturday morning for a lesson, only to find the airport closed. An hour earlier, a Cherokee 140 had taken off on runway 17, and ended up in the trees off the end of the runway. The two occupants had perished in the impact. Two factors seemed prominent in this accident -- the aircraft was packed very full with camping gear, and might have been overloaded. The other was the wind. While the wind sock might have been favoring 17 near the ground, the winds above the tree line were clearly out of the northwest. They had made a very marginal takeoff only to encounter a tail wind above the tree line. While no flying that day, the lesson was one of reflection and study. Whether tragedy or fun, all of it came to an end in June 1996. You see, the Atlanta Olympic Committee built the Tennis venue just a half mile from the end of runway 35. While the Olympics were in Atlanta, there would be no flying out of Stone Mountain, due to the Temporary Flight Restriction (TFR) around the Tennis venue. Owners of the airport decided to rent out the space for parking. By June 1, all the aircraft had to be moved to other airports. They then came and removed all the runway lights, and the fencing, and put down a crush-and-run surface down for parking. At the time, their intention was to re-open after the Olympics. Alas, it didn't happen. While closed, someone took an interest in the property and made the 30-odd owners an offer they couldn't refuse. They never re-opened. There were rumors that someone was going to build a retirement community on the property, perhaps a shopping mall. None of that transpired. Years later, a local model-aircraft club (Stone Mountain Flyers) bought part of the property and operate model aircraft on what's left of the runway. I drove down Bermuda road the other day. This road runs right past the airport, with about a half or quarter mile of trees in between. The south end of the airport property nearly runs into Bermuda. Years ago, there was a little spot on the road you could turn off and you'd have a clear view of the entire runway from the approach end of runway 35. That whole area is now grown up with pine trees over 40 feet tall. You can no longer see the runway. It is a sad and ignominious end to a place where I learned to fly. Other information and pictures, here.